From November 30 to December 14, 2018, the Kyiv International Institute of Sociology (KIIS) conducted its own all-Ukrainian public opinion poll. By the method of personal interview 2,034 respondents who live in 110 settlements of all regions of Ukraine (except the Crimea) were interviewed in a 4-step stochastic sample that is representative for the population of Ukraine under the age of 18. In Luhansk and Donetsk regions, the poll was conducted only on the territory controlled by the Ukrainian authorities. The statistical sampling error (with a probability of 0.95 and a design effect of 1.5) does not exceed: 3.3% for indicators close to 50%, 2.8% - for indicators close to 25%, 2.0% - for indicators close to 10%, 1.4% - for indicators close to 5%. 66.3% of respondents believe that a citizen of Ukraine possessing land / land shares should have the right to freely dispose of it, including the right to sell. 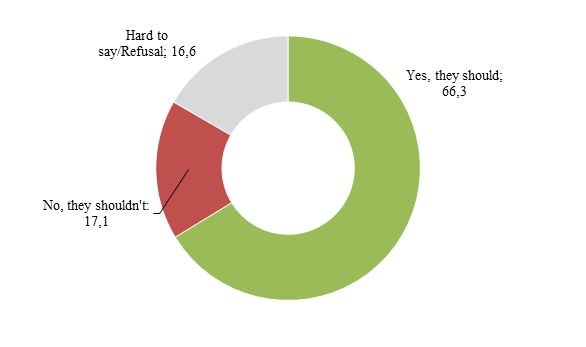 17.1% believe that a citizen should not have this right. Another 16.6% couldn’t decide or refused to answer the question. Comment of the Deputy Director of KIIS Anton Grushetsky: The opinions of the Ukrainian population regarding the issue of land purchase / sale are ambivalent. According to the joint study of KIIS, the Rating and the Razumkov Center conducted in the second half of October (the total number of respondents was 10,000), if the question was formulated "If today a referendum was held on the question of the purchase / sale of agricultural land, how would you vote? ", then 72% would vote "against", and only 13% would vote "for". That is, voting in a hypothetical referendum on the "purchase / sale of agricultural land" gives diametrically opposite results than the idea of a citizen's personal right to sell his land / share. First, the public opinion on this issue is not crystallized. Secondly, the opinions of the population are susceptible and sensitive to various manipulative statements, which cause high sensitivity to the formulation of the question in social surveys (and as a consequence, the opposite results). Obviously, there is a lack of reliable information on this issue, which would be trusted by ordinary citizens of the country and which would allow to form a stable public opinion. In your opinion, whether a citizen of Ukraine, who owns land / land share, has the right to freely dispose of it, including the right to sell? Below, in Table 1, the distribution of answers to the question is given in the context of individual socio-demographic segments.